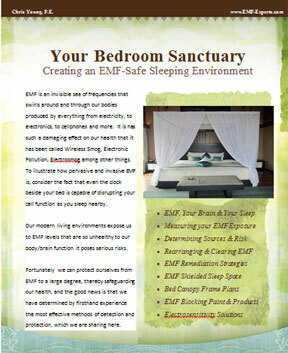 Yes, no mater how EMF-saturated your home, with this valuable new 145 page eBook you can block EMF from your sleep space, giving yourself a respite from relentlessly pervasive EMF and eliminating the rampant cell damage it does, during the most important hours of all – your vital, regenerative sleep time. Humans evolved in Nature's electromagnetic fields, such as solar energy and gravity, and we are not designed to cope with the constant bombardment of man-made electromagnetic fields. Our modern living environments expose us to EMF levels that pose serious risk to our body/brain function, taking a toll on our health, our sleep, our energy, and every mental, physical, emotional function you can name, by interfering with our well being at the most basic cell level. Fortunately we can block EMF and protect ourselves from the harm EMF does by disrupting normal cell function to such a large degree, thereby safeguarding our health, our sleep, our bodies and brains. The good news is that we have determined by firsthand experience the most effective methods of detection and protection, which we are sharing here in a new ebook in PDF format Which you can order below. Block-EMF Bed Canopy Building Plans and easy how-to instructions will enable you to construct this inexpensive four-poster canopy bed frame structure in an afternoon, using readily available materials, for a total cost of under $70. This DYI bed frame is designed for draping your choice of lovely EMF blocking sheer fabrics with no-sew ease for King, Queen, Double, Twin or Baby Crib bed sizes. Fabric cost depends on size of bed, the EMF-blocking fabric you select select and draping fullness desired and our step by step worksheets make it all easy to figure out. The attractive canopy bed with high performance EMF Blocking fabric and do-it-yourself bed frame shown here in this video offers a zero-EMF sleeping space. Sleep Sanctuary eBook includes no-fuss no-stress plans with easy to follow diagrams, construction materials shopping list, EMF shielding fabric comparisons and more. 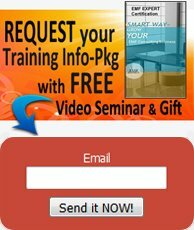 Instructional videos are included in order to illustrate the construction of the bed frame, choosing the fabric, use of the bed canopy in everyday life and more. Most importantly we include on video live EMF-Detection Metering inside the canopy upon its completion showing, beyond question, that even inundated with the super high levels of environmental EMF that we were dealing with, a safe Zero-EMF sleep environment can be achieved. 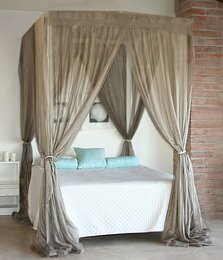 A bed canopy like this one pictured above, which is designed specifically to completely block EMF while we sleep, gives us several hours of much needed - in fact critically required -- EMF-free cell function in order to mitigate the EMF onslaught of the day. Good sleep is vital to our health. At night our bodies and our brains have the huge task of repair, regeneration and rejuvenation. Every “now I lay me down to sleep” begins a series of important cascading hormonal events that enable the body and brain to do these functions. Each cell has its specific job to do in a vast orchestration made up of precise electrical and chemical functions. Without good sleep, and sufficient sleep time, this cannot occur. EMF is scientifically well documented for disrupting cell function, to the point where our sleep is not restorative and our physical, emotional and mental function begins to break down. As this happens we become more and more sensitive to EMF. According to many authors EMF sensitivity has grown to epidemic proportions. Further evidence supporting this hypothesis is that many people who suffer from EMF sensitivity or EMR sensitivity, also known as electrosensitivity syndrome (ES), electrohypersenitivity disorder (EHS), and other names, have numerous other health problems. 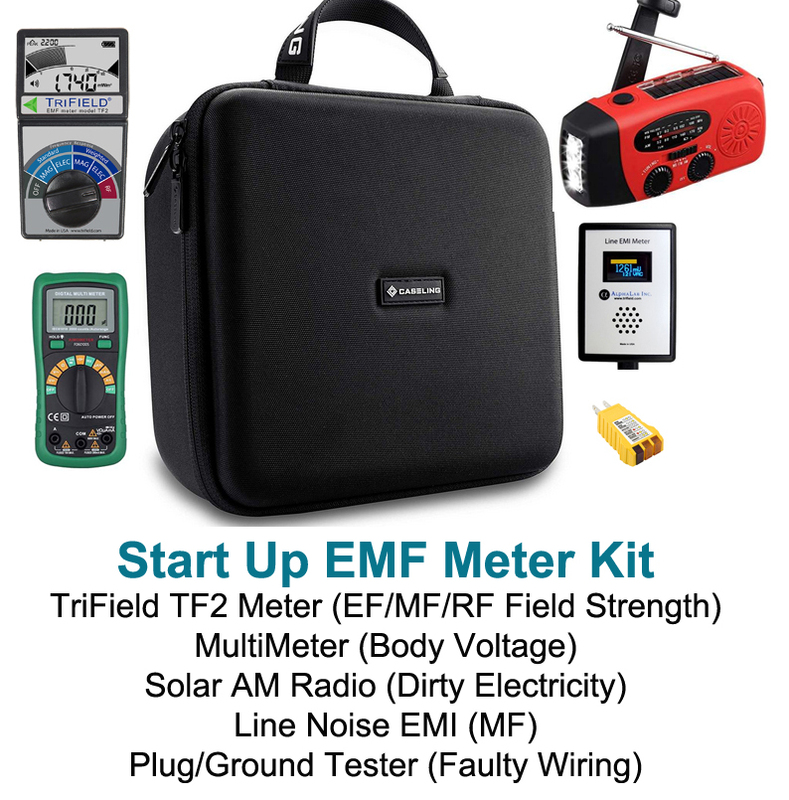 Contact EMF Experts by e-mail if you have any questions or concerns about this product, we respond as soon as possible, usually within 24 hours.